Jasmina was inspired by medical Anamnesis, a personal health record, to approach strangers in the streets of Vienna and write in-site the output of an improvised interview always starting with the question “How are you?” and working along with the answers of the individuals to reformulate following questions. This was made without previous deep research on the matter, that was approach during a second phase, in which a professional made anamnesis on her, which she exposed on the room next to the papers produced during her interviews. 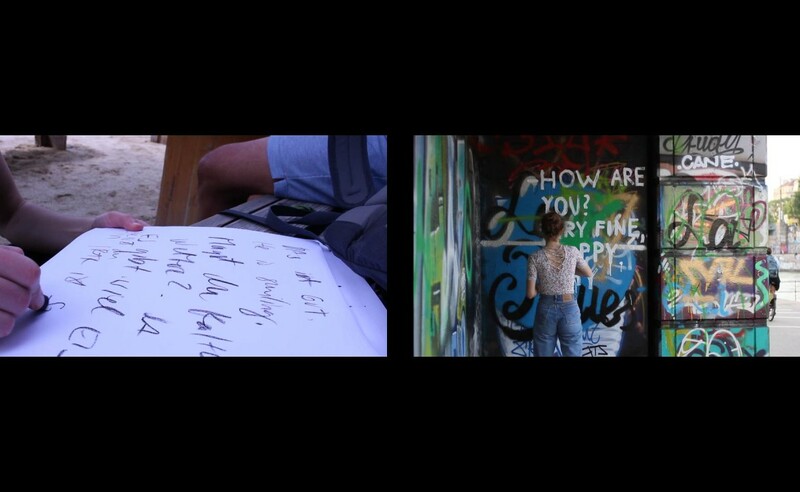 On a third phase, she wrote one of the interviews in the streets next to Vienna’s Donaukanal, from the wall, through the floor in the direction of the river flow, and exhibited a video of the performance in the room.